Bring classic architecture to your garden with the Gardman Gothic Trellis. With its overlapping diamond pattern underneath the gentle arch, the unit is reminiscent of patterns found on vaulted cathedral ceilings from the Gothic period. A rectangular gridwork below the decorative top creates a sturdy frame for the item, and offers several places for climbing plants to grip and entwine. Create patterns on your trellises by training your plants to weave through the squares as they grow, for a more geometric garden. The two legs insert into the soil for ease in placement, or use several in a line to create a screen effect. The black color strengthens the theme, while the coated steel construction keeps the item sturdy. 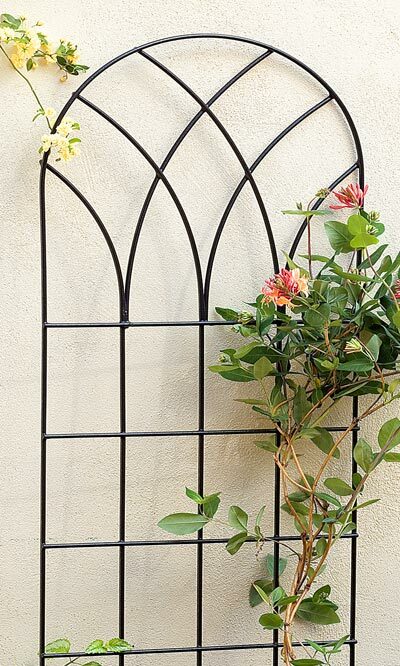 Enjoy a classic look in your garden with this Gothic Trellis.